UPPAbaby have created some really smart and easy to use strollers with the Cruz and Vista. The trick is to pick the right one for your growing family. What features do they both come with, and how do they differ? Should you spend the extra money on the Vista? All good questions, and in the following review I will tell you exactly which is better for what, and why, so you can make a quick and easy purchase decision. Now, let’s jump in and compare the Vista and the Cruz. UPPAbaby gives you most of their top-notch features in both of these strollers, but there are some key differences that are worth highlighting. I will break these downs into sections so you can jump to the most relevant for you, or read them all to get the details. In many ways this is the biggest difference between these strollers, to I advise reading this section thoroughly. The Cruz is designed to work and grow with one child from when they are first born, all the way to when they start to walk. Even if they need a ride in the stroller every now and again. The Vista is exactly the same, adapting to your children as they grow, only it can fit two kids on the same stroller/frame. That is not to say you have to have two kids, but it can. Both of these models adapt to your needs by using either using a bassinet, car seat or chair. Although the Cruz is basically a single child stroller, it does have the ability to add a second, older child with the addition of a ride-along platform on the back. 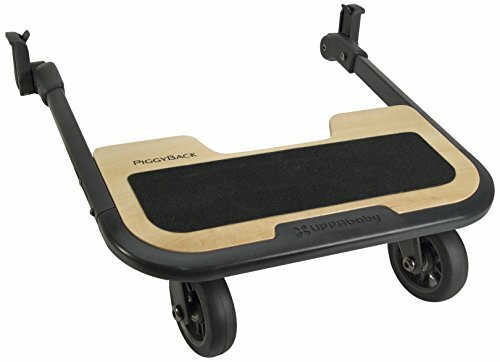 UPPAbaby call this a “piggyback” platform. You can see it below. The Vista has the same capability using the specific “piggyback” for that model too. So, as your children grow older and start to walk a lot more, you always have the ability to give them a ride if and when they get tired. This means the Cruz becomes a two child stroller, if you have one older and younger. The Vista can then become a three child stroller. The Cruz comes with a single seat which is generally all you need. You can add an infant sung seat for a newborn that needs support, as well as fully recline the seat. So, you don’t need a bassinet specifically. You can buy one though, if you decide you need one later on. However, if you want one straight away, the Vista does come with one when you buy it. Of course, the Vista is meant to fit two kids of the same or different ages, so it makes sense. But, it’s also great if you want the flexibility of a bassinet for the early months (which can be detached and carried) and a seat for later too. Just remember, if you want long term, comfortable sleeping then a bassinet is the way to go. A seat is great for shorter naps, but is not ideal for newborns. This is a very small difference, but the Vista has a slightly larger basket and capacity because it is a bigger stroller. It can carry up to 30lbs of whatever you can stuff in there, whereas the Cruz can only do 25lbs. Because the Vista can carry two kids, it needs to be bigger. As a result it is also heavier. In terms of design, the strollers are otherwise pretty much the same. It’s just a matter of capacity and the strength to work with that. The specs below reveal the details, but in short, its about 5lb difference and about 3 inches in the longest area (without the seat, which can be removed). This gives you an idea of whether it can fit in your trunk or cupboard at home. Now that we have covered all the fun stuff, let’s take a look at all the other great features that makes the UPPAbaby stollers such a great buy, no matter which one you get. UPPAbaby has really thought about this feature and give you almost everything you could possibly want in a stroller seat. It adjusts to five different positions, including fully upright and full flat. So, you can lay it down if your young one needs a rest. Or adjust to the right angle for their size and age. Vista seat recline positionsOn top of that, the leg/footrest area also adjusts so that you can adapt to your child’s legs. After all, nothing is more annoying than having your legs dangle for hours, right? The bumper on the front is also easy to put on and take off, but once it clips in, it securely stops them from falling out. Of course, there is also a 5-point belt system to hold them in too. The other smart feature I love on these prams is the ability to reverse the seats. So, when your baby is young, you might want them facing you, so you can keep an eye on them. But, once they grow a bit older and want to see where they are going, you simply turn the seat around – to front facing. Easy peasy! This video from UPPAbaby gives you an overview of all the seats features. The UPPAbaby strollers use a simple click-in system to attach the seat or bassinet. So, you can choose which one you want, and if you have the Vista, in which position too. It’s super versatile and allows you to keep the same stroller even as your baby grows. This same system makes it super-easy to attach adapters for child car seats as well. They automatically fit the MESA car seat, so if you have one of those you are good to go. Just clip it into the frame where the toddler seat or bassinet would go. If you have ever used or seen other strollers before you might know that sunshades are absolutely crucial. Not only to protect your child from the sun but also to keep them happy – because most children I have seen hate having the sun in their eyes! UPPAbaby’s Vista & Cruz both come with a super-smart shade system built into their seats and bassinets. I will talk about the one on the seat now for simplicity’s sake. It covers their head very well, and adjusts into multiple positions. But, on top of that, it also has an extended sunshade (SPF50) that comes out for times when you are walking towards the sun. You can see it in the image below. At the back of the shade there is also a “peekaboo” flap that you can lift up to check how your child is going (or to see what mischief they are up to). Super handy for when it is front facing. This flap is also magnetically closed, which is easy to use and quiet (in case they are sleeping – not that kids wake up easily anyway). Let’s not forget about you in this either! Opening and closing the stroller for storage or set up is easy as pie. A few bends and clicks and you are good to go. Everything is firmly attached (seat, bumper, etc) and easy to take on and off. So, when you need to get your child out, no problem. Change to the bassinet. Simply click the seat out and the bassinet in. Same goes for reversing the direction of the seat. 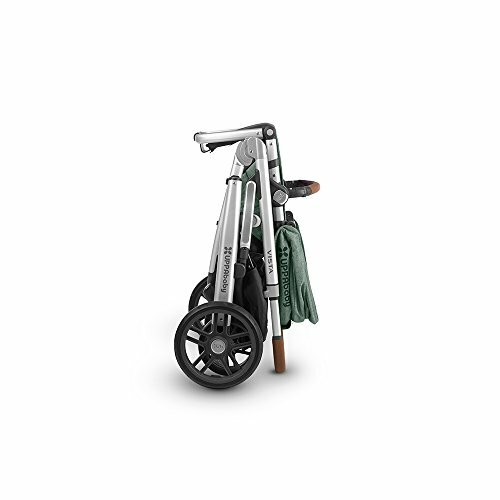 The handle on the stroller is also easy to change the height of, and is covered with a nice leather material – which makes using the stroller a pleasure. You can check out this and some of the other features I talked about above in this video. I think I have covered almost everything, and by now you have had enough of strollers, right? But one last think we should mention…accessories. When you are out and about with the stroller you are also bound to get thirsty. So, having your drink bottle easy to reach is a must. UPPAbaby have thought of this too and have an easy to attach organiser where you can stash all your “must haves” for your trip. They also have a cool little add-on for your toddler when they want to stop for a snack. It’s a snack table you can snap onto the front of their seat and place their drink bottle and snack in. Which Is The Perfect Stroller For You? When it comes to the Cruz versus the Vista it really comes down to how many children you have, or plan to have. And how far apart. If you have twins, the Vista is the obvious choice. If your kids are a few years apart, it could also work well. But if one is more than a few years older and walks a lot, then you could get away with the Cruz and a piggyback board on the back. With only one child the Cruz is the obvious choice. The Vista also comes with both the bassinet and toddler seat, which is handy, but it may still be cheaper to get the Cruz and buy the bassinet (or use your infant car seat?) because you don’t need the extra size and weight of the Vista unless you need to carry two younger kids. Either way, no matter which one you choose, the features and accessories are going to make days out with your kids a pleasure! UPPAbaby have you covered.